Dr. Hollingshead is a Neuroradiology Fellow and Dr. Castillo is a Professor, Department of Radiology, University of North Carolina, Chapel Hill, NC. 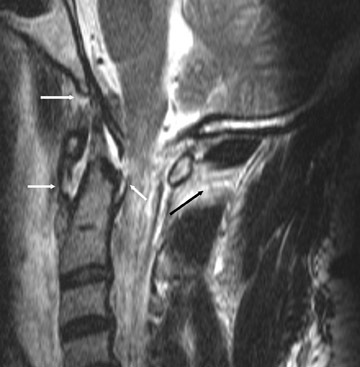 Some of this article was originally presented as an electronic exhibit at RSNA 2006: Hollingshead MC, Castellano F, Pulnik J, Castillo M. MRI of ligamentous and soft tissue injury in the cervical spine. Electronic exhibit at the RSNA 92nd Scientific Assembly and Annual Meeting, November 2006; Chicago, IL. Magnetic resonance imaging (MRI) allows the radiologist to directly evaluate all of the soft tissues of the spine, including the ligaments, cord, disks, and vasculature. Thus, it can be crucial in the evaluation of the trauma patient with ligamentous injury and possible instability. 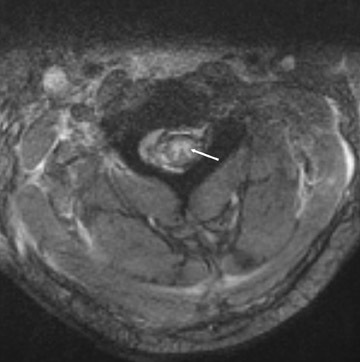 While radiographs and computed tomography (CT) may suggest soft tissue injury, MRI allows for direct visualization and confirmation. 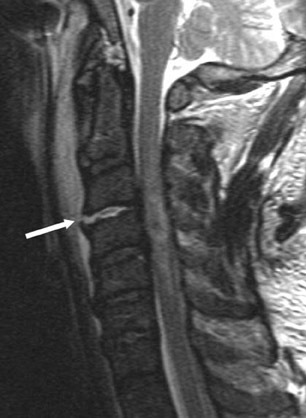 This article will review the use of MRI in acute spinal trauma. Recognition of soft tissue injuries helps guide patient management and surgery, results in changes in management, and influences prognosis. At our institution, patients with significant trauma undergo evaluation of the cervical spine with screening CT using reconstructed 2-mm axial images (acquired at 0.6 mm) with coronal and sagittal reformations. MRI is obtained in patients whose CT scans show a potentially unstable injury, obtunded patients who cannot localize symptoms, and those with neurologic symptoms. Our protocol includes sagittal T1-weighted (T1W), T2-weighted (T2W), and short-tau inversion-recovery (STIR) sequences (3 mm thick), as well as an axial T2*-weighted (T2*W) sequence (3 mm thick) without contrast. For the evaluation of thoracic or lumbar spinal trauma, an evaluation begins with plain films. 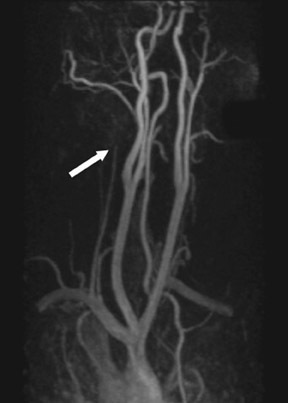 CT imaging consists of 2-mm axial reconstructed images with coronal and sagittal reformations, often all obtained from the raw data acquired during an evaluation of the thorax and/or abdomen. Our MRI protocol includes sagittal T1W, T2W, and STIR sequences (4 mm thick), as well as axial T1W, T2W, and T2*W sequences (4 mm thick) without contrast. 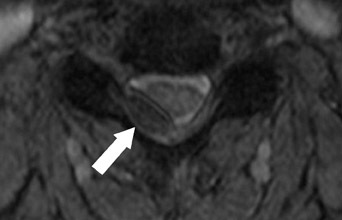 MRI allows direct visualization of some of the ligaments that support the craniocervical junction. Ligaments are generally linear, low-signal-intensity structures. The anterior atlantoaxial membrane extends from the axis, C2, to the atlas, C1. 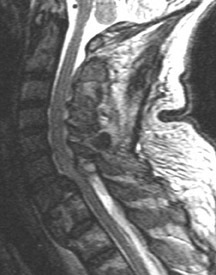 1 The anterior atlanto-occipital membrane extends from C1 to the clivus. 1 The apical dental ligament extends from the superior tip of the dens to the clivus. 2 Posteriorly, the tectorial membrane originates on C2 and extends to the clivus. 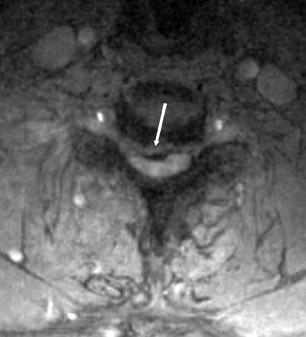 Deep to the tectorial membrane is the transverse ligament, which inserts on the internal surface of the lateral masses of C1. The alar ligaments are also deep to the tectorial membrane. Traditionally, in the subaxial cervical spine, one can attempt to identify unstable injuries by using specific measurements on plain films. 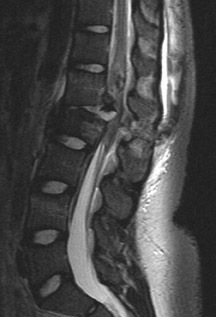 Daffner et al 9 described 5 radiographic signs that are suggestive of instability: displacement of a vertebral body by 2 mm, widening between the spinal laminae by 2 mm, abnormalities involving the facets, injury involving the posterior portion of the vertebral body, and an increased interpediculate width of 2 mm. Denis developed the "3-column model of the spine" for evaluation for thoracolumbar spine instability. 8,12 The anterior column of the spine consists of the ALL and anterior two thirds of the disks and vertebral bodies. The middle column includes the PLL and posterior one third of the disks and vertebral bodies. The posterior column includes everything dorsal to the middle column. Instability is indicated by injury to the middle column and one other column. This model has also been applied to the subaxial cervical spine. 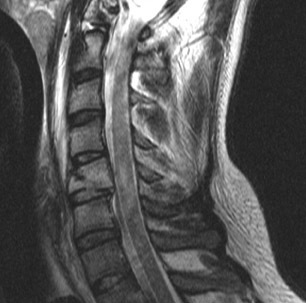 The role of MRI in the "clearance" of the cervical spine, particularly in obtunded patients, continues to be debated. 13-15 The goal is to identify an isolated ligamentous injury of the cervical spine that is not suspected on plain film or CT. Chiu et al 16 evaluated 14,577 patients who experienced blunt trauma. There was an overall incidence of ligamentous injury without evidence of fracture of 0.6%. Of the "unreliable patients," a total of 14 of 2605 patients (0.5%) had a ligamentous injury without associated fracture. MRI was not used in this study. 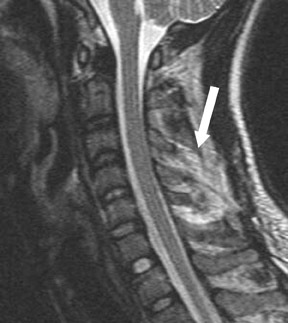 MRI allows the evaluation of the spinal cord. 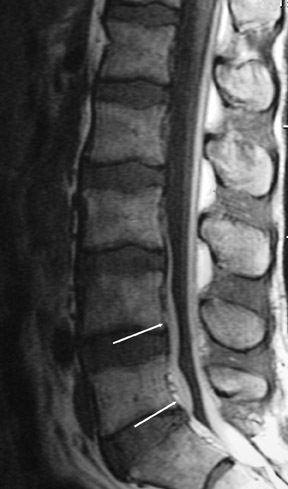 The cord may be directly damaged by a traumatic event or by impingement because of an associated injury, such as a herniated disk (Figures 4 and 5). 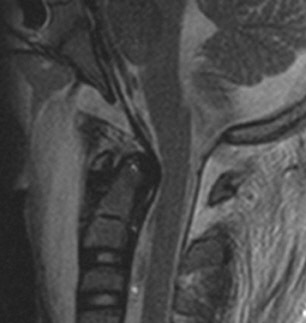 18 MRI can identify the level of cord injury and the associated soft tissue injuries. Because of this, it can assist in operative planning. The thoracic spine is stabilized by the ribs, leading to less frequent injury unless the trauma is severe. 38 The lower thoracic and lumbar spine is more mobile, which leads to an increased risk of injury. 38 Types of thoracolumbar injury include wedge compression, burst, fracture dislocation, and flexion-distraction (Figure 6). 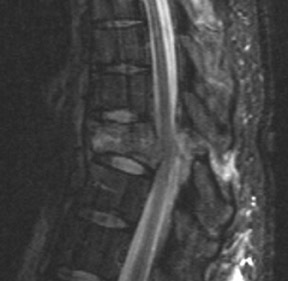 38 MRI allows visualization of the associated ligamentous and spinal cord injuries. 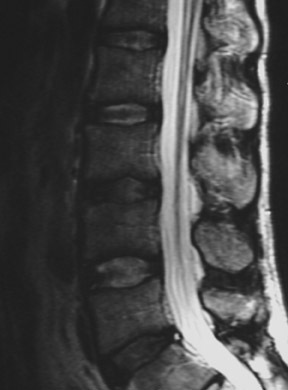 MRI allows the radiologist to directly evaluate the soft tissues of the spine and is, therefore, crucial in the evaluation of the patient with ligamentous injury and, thus, instability. Recognition of soft tissue injuries impacts patient management and outcome. 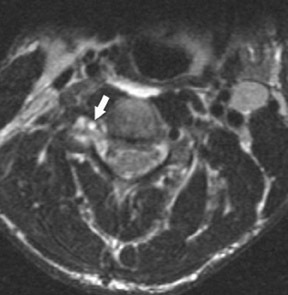 MRI in acute spinal trauma. Appl Radiol.